At the Hollytree Hotel and Swimming Pool, we offer a range of well appointed bedrooms which enjoy fantastic views of the Loch and Scottish Highlands and Self Catering lodges. Our bedrooms are fully en-suite many with their own private balcony, relaxing lounge area with comfortable chairs and are equipped with free Wi-fi, TV with Dvd player, hairdryer, telephone, radio alarm clock, complimentary herbal teas, tea, coffee, hot chocolate and biscuits and a selection of good reading books and DVD's. A selection of fine toiletries and fluffy towels are provided for our comfort. 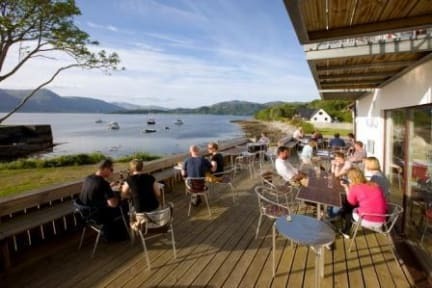 Enjoy the delicious fare and hospitality at the award winning Seafood Restaurant, the Captain's Lounge Bar with Outside Drinks Terrace and the Railway Lounge. Unwind after a busy days exploring in our fully heated luxurious indoor swimming pool and sauna. Our Self Catering lodges are adjacent to the hotel, over looking Loch Linnhe. They have equipped and finished to a very high standard, enabling you to enjoy a comfortable, stress free self catering holiday. Each lodge has a twin bedroom and a double bedroom and an extra foldaway bed should this be required for a fifth person, living room and kitchen area. 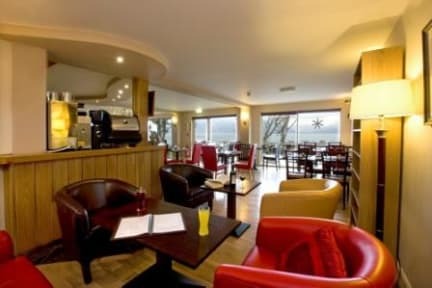 While staying at the Hollytree Hotel and Swimming Pool, some f the activities to be enjoyed include golfing nearby, fishing on site from our own pier, stroll or cycle along the cycle path next to hotel or try some diving nearby. We are an ideally base from which to discover Scotland and the Glencoe area.